jQuery Syntax is to select specific elements from HTML document and perform some action on selected elements with manipulation in Dot sign .. Original HTML and CSS files are not changed by jQuery and but in browser memory it changes only the representation of DOM of the page. $ sign is used to define/access a jQuery library. 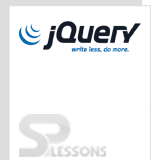 jQuery library is actually declared in a variable called jQuery. selector define the Query or select a specific element from HTML document. action() define the action() to be performed on selected elements of HTML document. CSS syntax is used by jQuery to select the HTML document elements. $(“p”).hide() : hide() function of jQuery hides all current <p> elements. In this below example : $ sign defines the jQuery library, p element is the selector and it will select all p elements of HTML document, hide() function is action to hide all current visible p elements of HTML document. Fade in/Fade out : This involves of hiding and showing html elements using nice fading effects. It is well used to show or hide a div and its content in a proper way. jQuery Syntax selects HTML elements and perform action on selected elements. $ accesses jQuery,selector selects HTML elements and action is a function performing some action on specified element.